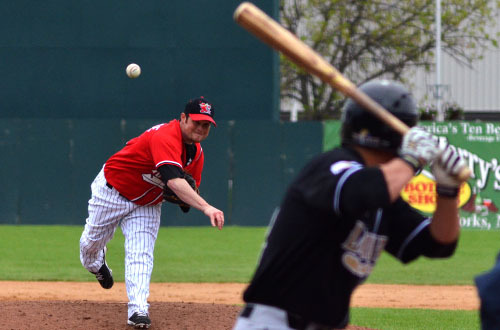 FARGO, N.D. – Ryan Sasaki allowed only five hits in seven innings and the Laredo Lemurs pulled out a three-game series sweep over the Fargo-Moorhead RedHawks with an 8-0 victory on Sunday, May 26, at Newman Outdoor Field. Sasaki struck out eight RedHawks and walked two to earn his first victory of the season. Buddy Sosnoskie was the only Fargo-Moorhead runner to reach third base off of Sasaki, but was stranded there in the first after a Nick Akins strikeout. Edwin Walker Jr. relieved Sasaki the final two innings allowing three hits and striking out four batters. RedHawks starter Taylor Stanton held the Laredo bats in check for the first two innings but the Lemurs capitalized in the third, scoring five runs on five hits. The inning was highlighted by a Jon Gaston three-run home run. Stanton (1-1) allowed three more runs through the fifth and sixth innings and picked up the loss before being relieved by MacKenzie King. King, Nathan Kilcrease and Joe Harris combined to pitch 3 1/3 innings of relief and gave up only one hit out of the RedHawks bullpen. John Allen hit an RBI single in the first, a two-run double in the fifth and a single in the seventh to account for three of Laredo’s 12 hits. Marcos Rodriguez improved his batting average to .394 with two hits in the game, while Jimmy Mojica and Sawyer Carroll had two hits of their own for the Lemurs. Keith Brachold went 2-for-3, Ronnie Bourquin hit a ninth-inning double, while Sosnoskie, Ryan Pineda and Clint Ourso singled to account for the six Fargo-Moorhead (2-8) hits. The Lemurs extend a league-best 10-game winning streak and remain undefeated for the 2013 season. The RedHawks continue their homestand at 5 p.m. Monday, May 27, hosting a four-game series against the Sioux Falls Canaries. Tickets are available at fmredhawks.com or by calling (701) 235-6161.